My tutorial on how to dye fabric shoes has been one of the most popular posts on this blog, and I thought another post on shoe care might be of use. 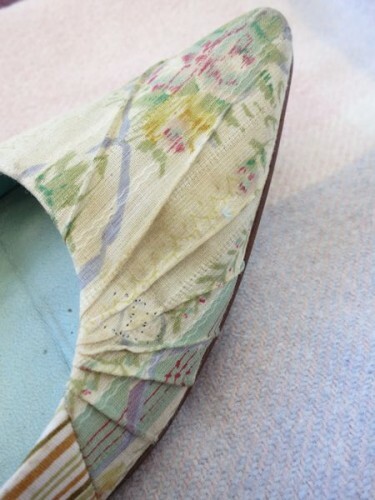 I recently acquired a pair of darling fabric shoes with fabric linings, but they were a bit grubby and needed cleaning. They came with a little strap and bow detail, but I didn’t like it and took it off. 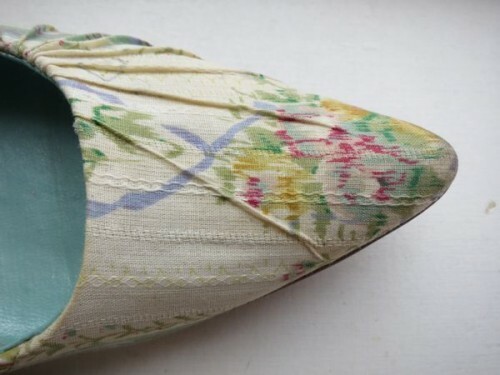 Clearly you can’t put leather-lined shoes through the wash, as most tutorials say to do for fabric shoes (they shouldn’t by the way, you should never wash any type of shoes in the washing machine as it will destroy the glue that attaches the sole to the fabric). 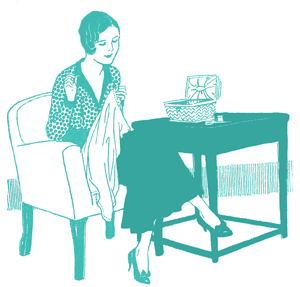 Here is how to clean fabric shoes properly and safely, whether they are leather lined, or just full fabric. 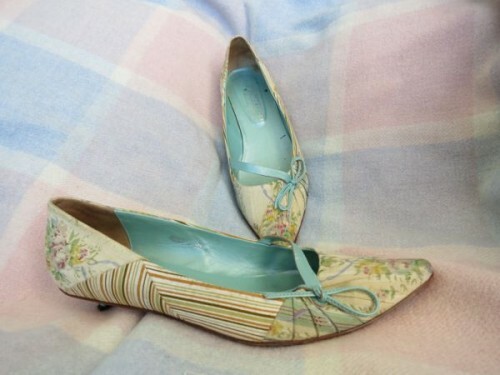 Your fabric shoes – this method works best for flat fabric shoes, it is not recommended for velvet or brocade shoes. 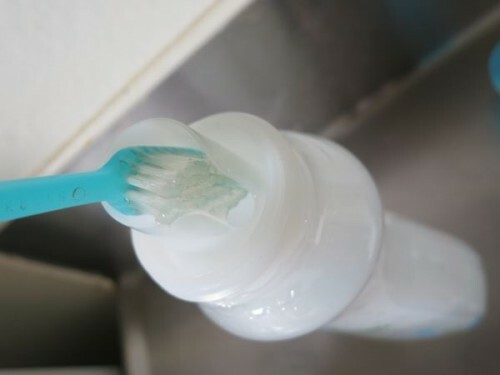 Shake most of the water off of your toothbrush. 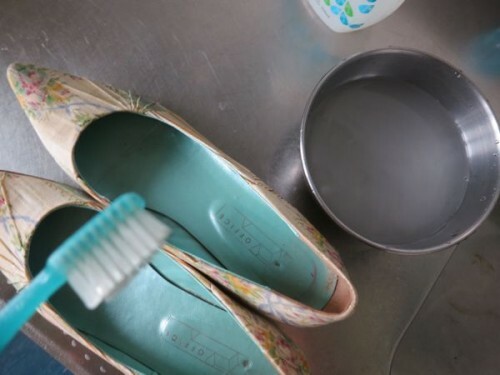 You want to clean the shoes while keeping them as dry as possible, so it’s important to get most of the water off of your toothbrush, so the shoe gets barely damp. With your damp toothbrush, scrub the soiled areas of your shoes, using back-and-forth strokes that follow the grainline of the fabric. This will create a bit of sudsing on the surface of your shoe. 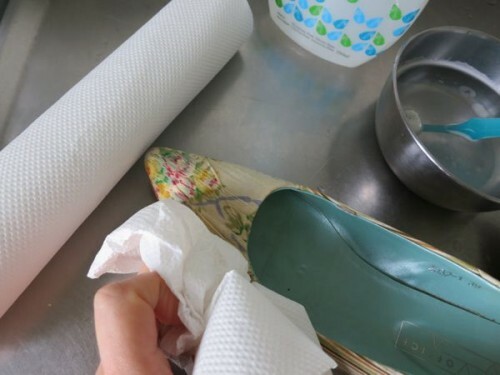 Brush and scrub the entire surface of your shoe, scrubbing most on any areas that are heavily soiled, and dipping your toothbrush back in the bowl to dampen it as needed. 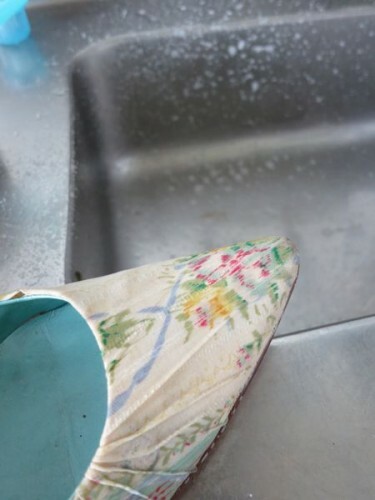 Your shoes will get damp – you just want to use as little water as possible. 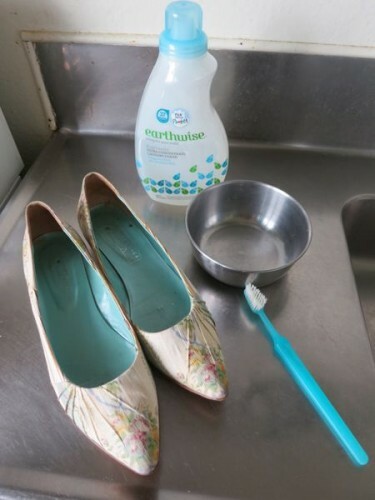 Once your shoes are thoroughly scrubbed and looking much cleaner, rinse your bowl and toothbrush, and re-fill the bowl with clean, non-soapy water. Keep rinsing your toothbrush to get rid of excess detergent as you brush off the detergent, and then tapping it as dry as possible. 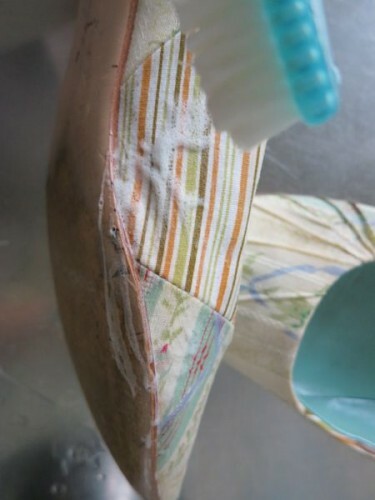 Then put your shoes to dry in a well ventilated area, away from direct heat and sun. Once they are fully dry, you can appreciate how much cleaner and prettier they look! I am so pleased with how much better my shoes look. It’s pretty subtle in photographs, but so obvious in person! I hope this was helpful! It certainly made a difference with mine. Hehe. I was hoping someone would notice that! I was very pleased with the effect myself! BTW, in this country, we use newspapers to wad our shoes when drying. 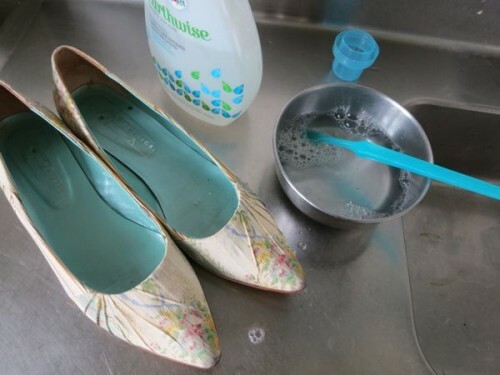 If you are reasonably sure it will not stain your shoes, you can use that. I wouldn’t use newspaper! 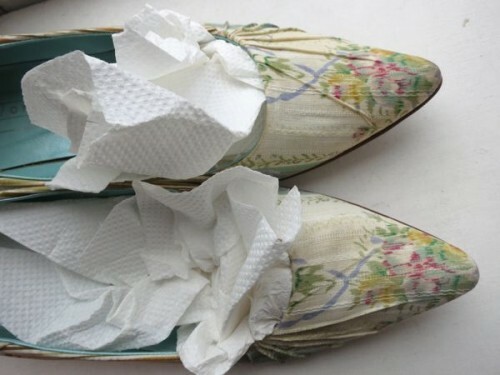 The chance of it staining your shoes is just too high. I have to wash my hands after I read the newspaper here – they are just so grubby from all the ink that rubbed off. I guess that depends on the country and the newspaper, then! Thanks! Love these summer shoes. Your technique worked beautifully and saved me at least $70 for a replacement pair, which BTW, I have not been able to find! Thank you for these clear and helpful instructions, I will try on my son’s shoes – bit of a challenge! 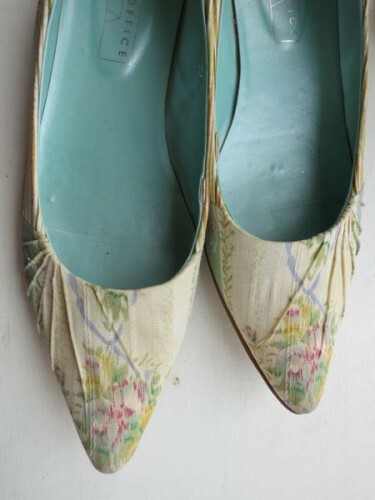 And your floral shoes are so very pretty! Same situation as yours, my too-cute-for-words recent acquisition (bohemian-tattered-pink-floral-print-on-a-solid-pink-fabric-background shoes with leather lining inside) were very grubby indeed, and in serious need of a good cleaning. So I went looking, and found your tutorial. 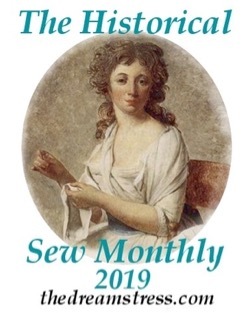 I was about to use a cold water detergent for wool and delicates, when I had a brainwave (such things do happen to me on occasion): I have a bit of no-rinse carpet, fabric, and upholstery cleaner left over, which is good for just about everything. I diluted it to the strength recommended on the bottle, and applied with a toothbrush as per your suggestions. 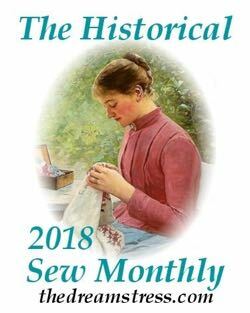 I cleaned one small area at a time, and then immediately dried by folding a paper towel over the edge of the shoe where my foot goes in, and squeezing that between my thumb, which was on the outside of the shoe, and my fingers, which were on the inside. The fabric is now air drying, so the final result is yet to be seen, but at the moment they look SO much better! Thank you so much! Brief update: Yes, this technique works like a charm! 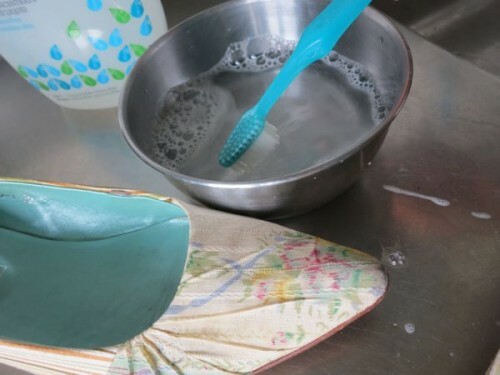 The no-rinse cleaner drys to a powder, so I simply brush the shoes with a soft natural bristle brush to remove the residue. 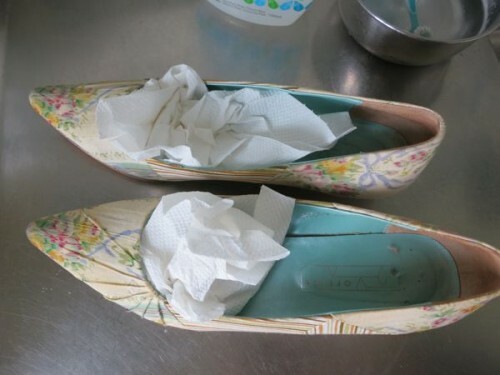 I have since used this method to restore some seriously stained satin pumps from the 80s that I thought would never come clean, and they now look like new. Lovely! 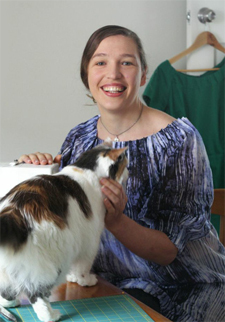 Shoes with leather linings can be treated with leather conditioners to keep them in good order, but synthetic linings disintegrate over time, and there is nothing that can be done to stop that. Great advice! 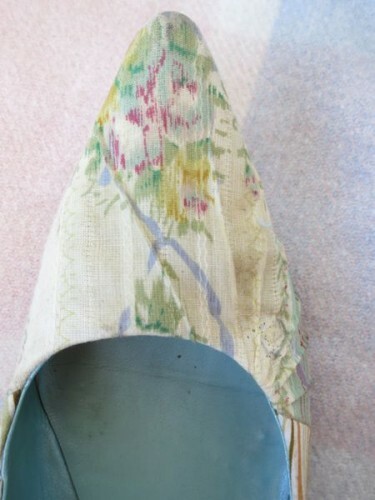 I have one pair old fabric shoes which need cleaning. My mom bought them for my 20 b-day. I love them sooo much. But now they are old and dirty. Finding your post gives me a hope that I could save them. Thank you so much. Greetings! Thanks so much! I would also recommend if the shoes are very dusty or dirty, (such a fabric/leather shoe combo worn for an outdoor wedding with lots of dirt!) to use a dry toothbrush to gently brush off as much dirt as possible before proceeding with the above method. Of course my daughter’s shoes are navy blue and white striped! Very helpful info, thank you! And your shoes! Good find!